(Left) Aramazd Andressian Sr. is seen in court on Tuesday, Aug. 1, 2017. (Right) Aramazd Andressian Jr. is seen in a photo provided by family. 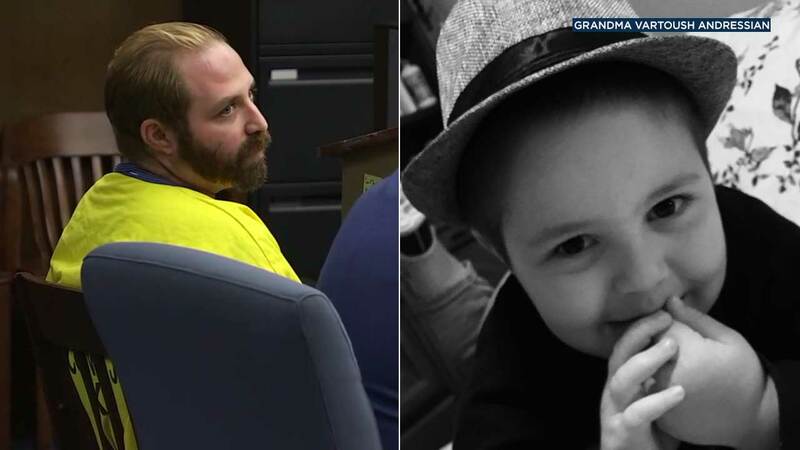 LOS ANGELES -- A California man pleaded guilty Tuesday to killing his 5-year-old son after a family trip to Disneyland, setting off a search for the boy that lasted more than two months before his body was found near a lake. Prosecutors contend 35-year-old Aramazd Andressian Sr. killed son Aramazd Jr. to get back at his estranged wife. His lawyer declined to comment about the theory but said the boy's death was "not planned." Andressian entered the plea to first-degree murder to avoid the death penalty, attorney Ambrosio Rodriguez said. Andressian confessed to killing his son and told detectives where to find the boy's body, Rodriguez said, but would not say how or why the boy was killed. Authorities also have not released those details. Andressian acted alone and his family is "as devastated as everyone else," Rodriguez said outside Los Angeles County Superior Court in suburban Alhambra. During the hearing, the boy's mother, Ana Estevez, loudly wept in the front row of the courtroom as she held the urn with her son's ashes. She was surrounded by family members - all holding hands and sobbing. Andressian Sr. was told he will face 25 years to life in prison when he is sentenced Aug. 23. Prosecutors called the evidence in the case overwhelming, though they didn't elaborate. "This is a tragedy. Cases like this really tug at your heartstrings," Deputy District Attorney Craig Hum said outside court. Los Angeles County sheriff's investigators have said they believe the boy was killed April 21 after a family trip to Disneyland. The next day, his father was found passed out in a park and police began searching for the boy. Andressian had taken prescription pills and was found in a car doused in gasoline in an apparent suicide attempt, sheriff's officials have said. The boy's body was found on June 30 near Lake Cachuma outside Santa Barbara - about 145 miles (233 kilometers) away from Anaheim, where Disneyland is located. Andressian told investigators that he drove to the lake the day his son was killed. Investigators had searched the lake several times before the boy's remains were found.